Cut into a steep hillside, this cast-in-place concrete single-family residence (completed 2010) is situated on the Puget Sound in Marysville, WA. I worked on this project while employed at Kovalenko Hale Architects. 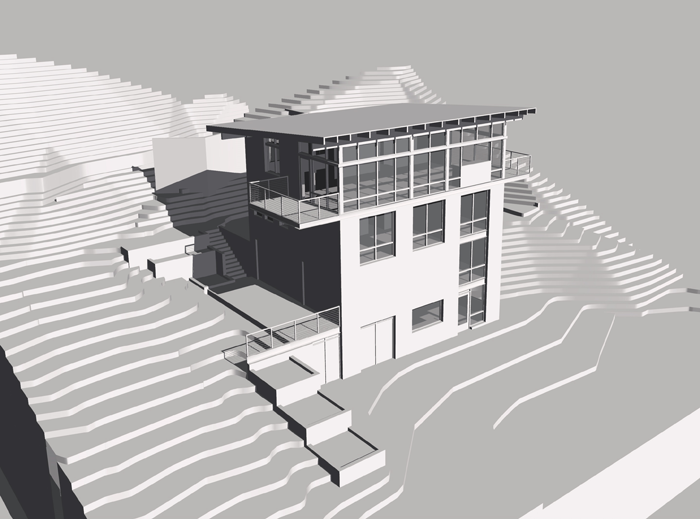 This project included the challenges of being located within numerous 'critical areas' -- including a steep slope and proximity to an endangered species habitat (Puget Sound and a tree containing an eagle's nest). My roles on this project included drafting the construction documents, coordinating with the structural engineer, and creating 3D computer renderings. All imagery on this page was completed by myself, but remains the intellectual property of Kovalenko Hale Architects.